F&W’s Ray Isle gives his best wine buying and serving advice for the clued-in and the clueless—from how many bottles to purchase for a party to what gifts to give an oeno-snob. 1. Should I rent glassware or buy it? For parties of 20 people or more, renting makes sense. It will cost up to $1 per stem or so, and there’s no cleanup involved. Contact a party rental company (they’re listed in the Yellow Pages). If you throw frequent parties, buying glasses may be a better bet. Crate & Barrel’s Viv line runs $3.95 a stem (crateandbarrel.com). Yes, for three of the four. 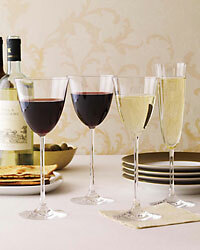 The Riedel Vinum series Chianti/Zinfandel glass ($44 for two; williams-sonoma.com) is high-quality stemware that works very well for both red and white wines and can serve as a water glass, too. For Champagne, Robert Mondavi by Waterford flutes ($50 for two; waterford.com) feel especially nice in the hand. 3. How many servings are in a bottle of wine? The standard bottle is 750 milliliters, which is about 25 ounces. That translates to five 5-ounce pours, which is considered the correct amount, no matter the size of the glass. 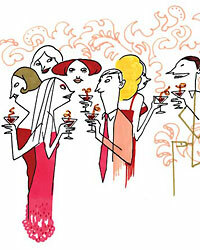 The F&W superfast guide to calculating how much wine you’ll need for a party. About how long does it take to bring wine to the proper serving temperature? One foolproof way to get red-wine stains out of carpets and upholstery is Wine Away ($9; 888-946-3292 or evergreenlabs.com), a spray made of fruit and vegetable extracts. If you don’t have Wine Away, blot up as much of the stain as possible with a paper towel or clean cloth, saturate the area with cold water, blot that up, then apply a paste of three parts baking soda to one part water. Let the paste dry, then vacuum it up.